Under the title of Swiss Re Next, we are currently constructing a replacement building for the former Neubau (“new building”) at the Group’s Zurich headquarters. From the start, sustainability was defined as one of the key features of the project. Our goal is to be awarded the MINERGIE-P-ECO® certificate as well as the highest certification level of the US LEED system (usgbc.org/leed) – LEED Platinum. We have received the preliminary MINERGIE-P-ECO® certificate and successfully passed the LEED design review. As Swiss Re Next is nearing completion, one important feature is becoming more and more visible: its open, transparent workspace concept. This has been a key element of the planning process since its beginning, reflecting two important goals we pursue with Swiss Re Next: to support and further strengthen our communicative work culture based on team work and knowledge exchange; and to provide the flexibility to cater for the varying work situations typically encountered today. At present, our individual workplaces are already occupied less than 50% of the time on average, while meeting rooms are generally used to the full. Ongoing digitalisation will further increase the need as well as the possibilities for communication and networking. Thus, there will no longer be any assigned workplaces or single offices at Swiss Re Next. Instead, our employees will find a varied design with think tanks, meeting rooms, lounges, temporary workplaces, informal meeting areas, service zones and cafeterias. 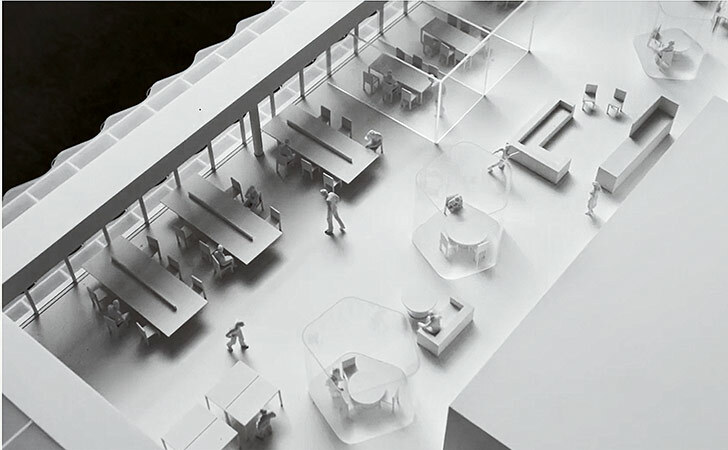 At the same time, the teams will retain dedicated areas of their own, called “home bases”, equipped with adaptable workbenches for four to six people. Importantly, access to these home bases will be through communal zones with generous coffee bars, encouraging spontaneous encounters. Such an open, flexible workspace concept has a further advantage. Because it allows us to use available space more effectively (with 1 100 employees sharing 800 workplaces), it comes with a substantially smaller environmental footprint. And this is fully in line with the ambitious sustainability goals we have set ourselves with Swiss Re Next. Extensive background information on the Swiss Re Next project and its progress is available on a special website at next.swissre.com.